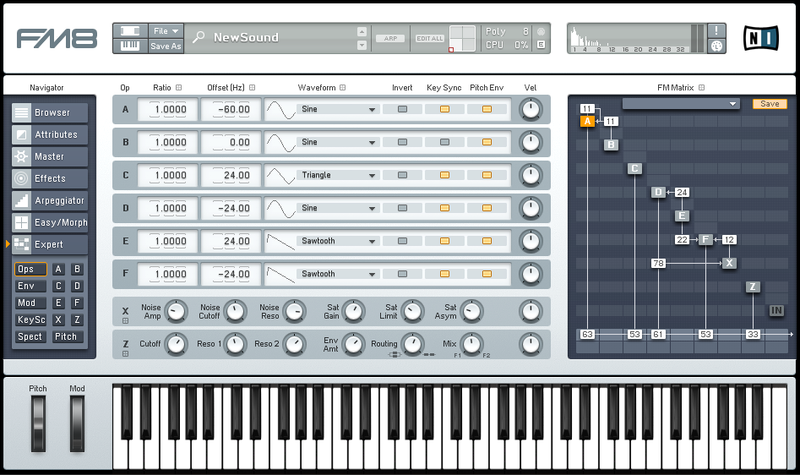 Today I will show you one way to design a ripping, gliding siren synth in just a few minutes. A perfect sound for creating huge amounts of tension in your mix. This kind of sound has a lot of audible character and can come across as a difficult sound to create from scratch, but really it is just a matter of aligning very simple sounds and introducing the right amount of noise and feedback. After this, all that is left is balancing frequencies and making sure there is not too much high or low end in the mix. There are many ways to make a sound similar to this one, but this allows for so much flexibility and produces a ver clean signal to work with. It makes it very easy to work with. Lets start by setting up the FM Matrix real quick. As you can see in the image, we are going to be using all of the operators in FM8, but there is very little in the way of tweaking the individual settings. Beginning with Operator F, we will load a sawtooth wave and route it to the output but not before adding some noise from operator X and modulating it with operator E. Operator E, also running a sawtooth wave, feeds into operator D, which in turn is set up to modulate operator X with it’s sine wave, as well as being routed to the output. This not only creates another audible layer, but it is also helping to keep the sound evolving yet maintain elements of these simple sounds. Operator C is loaded with a triangle wave and routed directly to the output, as is operator A after being modulated slightly by operator B, both of which are loaded with sine waves. As shown in the the Expert Ops screen above, each of the wave types and their pitch offsets are listed for you to see. You can also see the setting for the noise and filter oscillators. The routing, operators and modulators may all seem a bit technical and daunting if you are just starting out with FM synthesis, but it really just comes down to a few simple things. What sounds are coming from each of the oscillators? And why, of course. One you get your head around this, it makes things much easier and you begin to find yourself creating some killer sounds unassisted. So our first sound, coming from operator F is a mid-range, fairly clean buzz sound. It gets nasty after we modulate it with operator E. More than anything, it has to do with the wave form and the fact that they have opposing pitch offset values. Operator D and C together are the elements that you hear that is reminiscent of a Tron light bike. Operator A is acting as a sub bass for more support in the higher pitch range as the sound glides up. And operator B is adding just a small amount of movement to that sub. A very simple Peak EQ is set up to accentuate some of the high end and remove a touch of the low-mid range frequencies to keep things clean. We can now activate our glide by turning on portamento, and then turn up our voicing. The last step is to detune the synth so that we get as much phased character we can squeeze out of it without going overboard. You can hear what the siren synth sounds like on it’s own in the first audio example below, and with some other instruments in the second example to give you an idea of how it ca cut through a mix. As with all my tutorials, there is no processing in effect with the sound examples. The sound I have designed in FM8 is exactly what you hear below. If you have a request for a tutorial for FM8, or if you happen to have one you wish to share with the community, shoot us a message and let us know. It’s always great to hear from our fans. Thanks for stopping by!